Marigny is my very favorite New Orleans neighborhood. (And that’s saying something!) It’s just outside the French Quarter and full of authentic New Orleans architecture and culture. Plus, the nightlife is excellent. Here are a few places I love most. 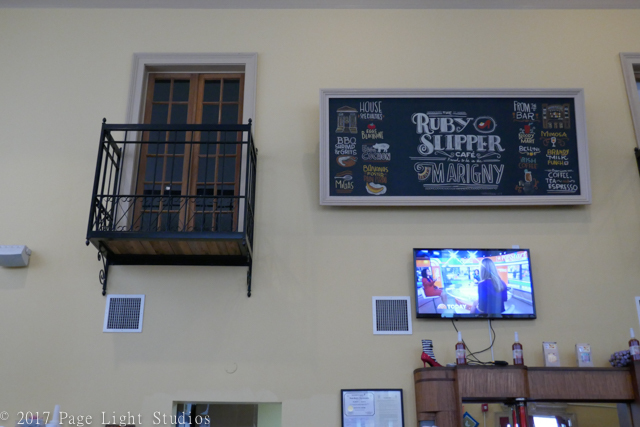 Two Ruby Slipper restaurants are open in New Orleans, one on the north west side of the Quarter and one in Marigny. Both are fantastic. The biscuits and gravy are especially great. 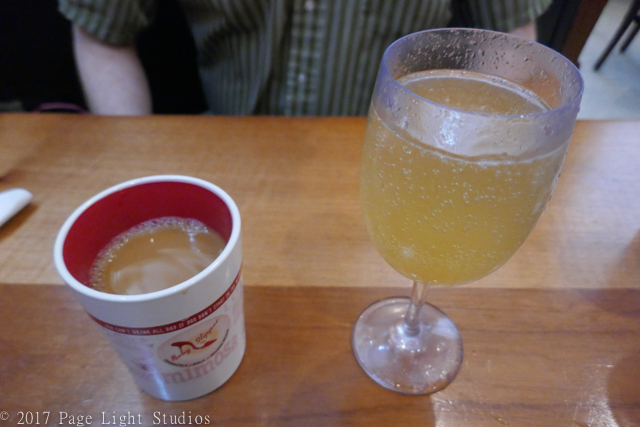 See the photos below for a sparkling brunch mimosa and cool decor. If you visit the Marigny location, check out the interesting stained glass windows. I was warned: there’s always a line to get into Port of Call! So I showed up early and waited for the opening. I was lucky to get a seat right away. To my delight, I found tiki and nautical-themed decor. It’s dark and cozy inside. The staff was friendly and answered my questions about what the neighborhood is like during off season. The burger was delicious. And check out the chives on that baked potato! It’s a little restaurant in Marigny, called Marigny. They serve outstanding traditional New Orleans cajun fare, and it’s better than many of the restaurants in the Quarter that serve similar. There’s gorgeous Jazz art on the walls and cool music playing. Plus, it’s a great place to start your evening on Frenchman Street. Next, check out the cool bar only a few doors down. I walked into dba on a random weekday evening… and I caught Grammy Winner, Jon Cleary, rocking the stage in an awesome concert with no cover charge! This was one of many amazing musical experiences in NOLA that represent what I love so much about the city. Also? Dba is an easy, cool place to grab a drink while watching a Mardi Gras parade on Frenchman Street. Grab a glass of wine ‘to go’ and head across the street to the Frenchman Street Art Market. Dozens of local artists display their work in a large open lot. There’s sculpture, painting, jewelry and more. The artists are all local and genuine; you won’t find touristy prints or mass-produced trinkets. The art culture in New Orleans is extraordinary, and this market is one of three of the finest outdoor galleries in the city. (The others being Jackson Square and Pirate’s Alley). This famous Frenchman Street staple offers authentic jazz and blues in a gorgeous setting with a cool atmosphere. There’s also great food. I highly recommend it. There’s often a line to get in, so definitely put this place at the top of your list if you’re in town off season. This club is authentic, local New Orleans personified. It’s the best. It’s always busy but never too crowded to welcome a lover of jazz. The bands are local, and they play on a tiny stage about a foot from the audience. There’s gorgeous local art on the walls, too. This bar is a delight. There’s no food here, but the drinks are cheap, and the patrons are friendly. Go, and experience the Smooth. There’s usually a big brass band playing great traditional New Orleans music here. The bar is large, with plenty of room for standing, in case you’re visiting during peak season. But I recommend heading to the back to sit in the comfy sofas. The back section feels cozy and private, like you’re in an exclusive VIP room. This dragon-themed dive has a fun, gritty atmosphere. It’s located far enough outside the Quarter to attract locals, and there’s a great stage for bands. I was lucky enough to catch a fun, young jazz band with a badass oboist as lead. Note: everything is red there. It’s cool. Can you visit New Orleans during Mardi Gras? If so, then you must see a parade! We caught the first of the season, put on by Krewe de Vieux. It was WILD. You can find the parade routes and schedules online. I decided to watch on Frenchman Street. See below for all the beautiful costumes and masks. Everyone was in the best mood, and the parade was amazing. I always assumed Mardi Gras parades were too crowded and crazy to enjoy. I was wrong. … and by morning, the trash is cleaned, the streets are empty, and the Quarter is new again. Only photos and memories remain. Go, and make your own! A couple of blocks off Frenchman Street, R Bar is where you might end up if it’s late but you aren’t ready to go home. Maybe it’s your last night in NOLA, and maybe you don’t want your trip to end? This is the place for you. With eighties films playing on a TV screen, tiki decor, voodoo and Mardi Gras trinkets everywhere, an old dentist’s chair for sitting, a pool table, and a comfortable, welcoming bar, you’ll enjoy your last drink of the trip. If you visit any of these places, comment and let me know what you think! And if you’re curious for more, see my other posts on New Orleans.